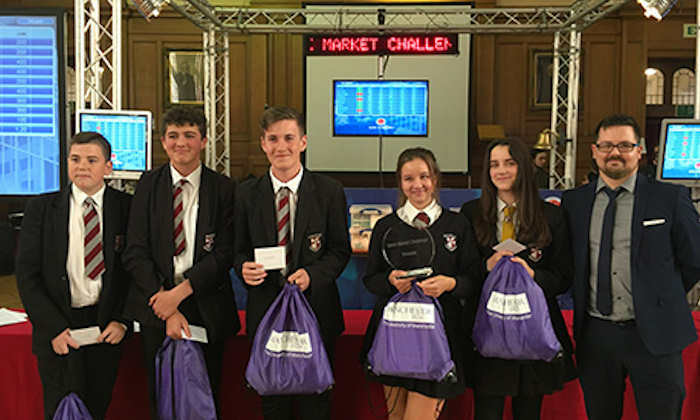 Alliance Manchester Business School, in partnership with Global Investor Simulations, has hosted a Stock Market Challenge and Investment Challenge event for St. Paul’s High School, Audenshaw School and Runshaw College. The Stock Market Challenge saw 120 Year 10 pupils compete on a live stock market trading floor in the Great Hall at Sackville Street. 180 Year 12 students then competed in the two-day interactive Investment Challenge to develop their skills in finance and improve their business awareness. The Year 10 pupils had to navigate their way through fast-moving, constantly changing market conditions on a live trading floor staffed by staff and students from the Business School and wider university. The Year 12 students competed in pairs in Finance Lab, a business simulation game.